Jim acquired his interest in agriculture while working on his family’s farm in the Mississippi and Missouri river bottoms, just north of St. Louis, Missouri. 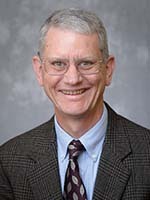 Over the course of his career, Dr. Mintert has received numerous awards, including Outstanding Extension Program Awards from both the American Agricultural Economics Association and the Western Agricultural Economics Association, in addition to the American Agricultural Economics Association’s Premier Forecaster Award for his livestock production and price forecasts. Jim is also the author of more than 200 publications focusing on the economics of the livestock industry.